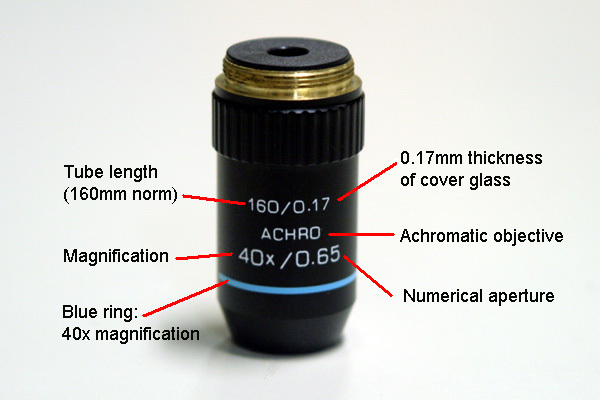 The numbers written on an objective designate different optical characteristics and standards. What do the numbers and abbreviations on an objective mean? Especially when buying used microscopes from research laboratories or hospitals a basic knowledge of the text written on the optics can become handy. You don’t want to buy things that you don’t need. A or ACHRO (depending on brand): This signifies that the objective is an achromat. This means that chromatic abberration was corrected for 2 colors (in contrast to the expensive APOchromatic lenses). Achromatic lenses are those most commonly found in education, they are the cheapest. PLAN: These objectives produce an image which is in focus from edge to edge. They are used for photographic work and are more expensive. PLANAPO: This refers to a planapochromatic objective. It produces a flat image (in focus from edge to edge) and it is has a chromatic abberration correction for 4 colors. Expensive and not needed for educational work. PLANFL: A Planfluorite objective. A bit less expensive than the planapochromats but also not as fully corrected. 160: This represents the standard tube length of 160mm. Objectives with this standard are interchangeable between manufacturers. 0.17: This represents the thickness of the cover slip to be used in mm. Coverslips with a deviating thickness will result is an image of lower resolution. OIL: This designates an oil immersion objectives. Do not immerse non-oil objectives into immersion oil! WI: Water Immersion. Here water is used instead of oil. 0.65 (etc): This is the numerical aperture. This value indicates the angle to which an objective is able to receive light. This value also determines the resolution of the system. For maximum resolution, the iris diaphragm should be set to a value equal or larger than the numerical aperture of the objective in use. NCG or NC: These abbreviations stand for “No cover glass”. These objectives are designed to be used without a cover glass. They are useful in the medical area where blood smears etc. are observed. LWD or ULWD: These abbreviations stand for “long working distance” or “ultra-long working distance”. These objectives are able to work with a large specimen-objective distance and are used for specific applications. P, POL or SF: These objectives are designed to be used for polarization microscopy. The objectives are strain-free (SF) and will therefore not modify the polarization of the light. They are not necessary for simple polarization microscopy conducted in classrooms. PL or NH: These are designation of objectives used for phase contrast microscopy. A PL (positive low) objective produces an image of a specimen which is darker than the background, a NH (negative high) objective produces an image which is brighter than the background. NIC or DIC: Nomarski Interference Contrast or Differential Interference Contrast objectives produce an image of a specimen which appears to be slightly 3 dimensional. If you use a filter to achieve oblique illumination, then the result will look similar. “About the numbers on objectives” I thought that this was very useful, but I have seen some lenses with the “infinity” sign. Am I to assume that this type of lens could be used on any tube length ? The infinity objectives can only be used on infinity microscopes. They are a different than the “finite” objectives. As a matter of fact, infinity objectives of different manufacturers are not even interchangeable with each other. It’s not only a question of optical design, also the threading is different. The infinity objectives require additional optics in the body of the microscope. The advantage of the infinity objectives is that it is possible to introduce additional filters into the light beam without changing the focus of the microscope. Hi all, on a few occassions, a sellor on eBay offers images of an objective for sale…but with crucial engravings: 160 , or ‘the infinity sign’ , or ‘0.17’ not shown in the images of the item. It gets frustrating when you contact the sellor, and they do not /can not tell you if the item for sale is a: ‘160’ , or an ‘infinity’ objective. This happened with a black colored objective said to be: “Meles Gerote”/80x…but nothing about wether: ‘160’ , or ‘infinity’ objective.